When it comes to desktop pages, Google has long demoted content that is “hidden” behind tabs, accordions or clicks. But with the move to mobile first, this can complicate matters. 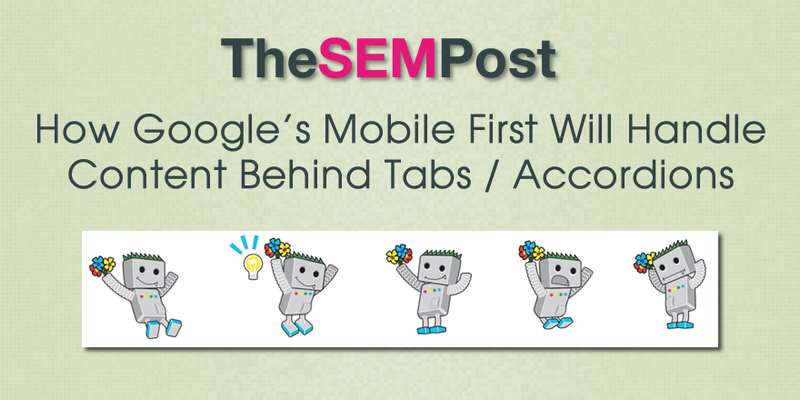 It is a common tactic to put mobile content into tabs for multiple reasons. First, when a site uses a longer amount of text on a mobile page, accordion tabs can make it easy to collapse sections that can then be expanded by the searcher, if they want to read more on that particular section. Second, it is far better for a user experience, since it doesn’t require as much scrolling. 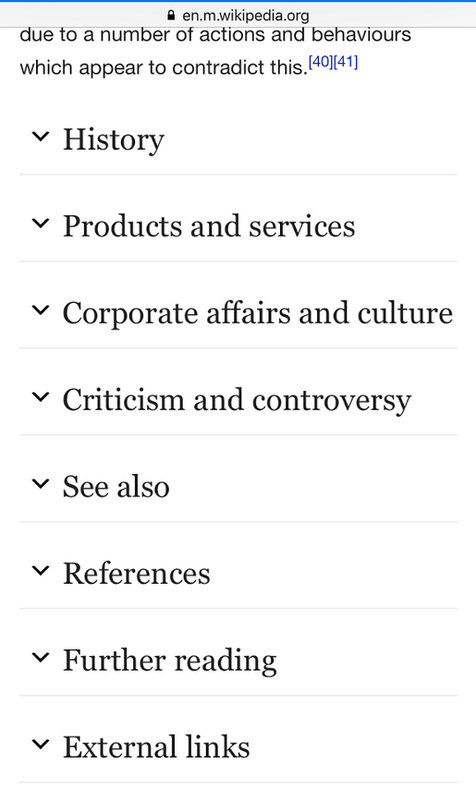 Here is an example of this, from Wikipedia… any section can be expanded to show the complete text in those sections. The question has come up a few times on Twitter since the initial announcement, and Gary Illyes from Google commented that there should be no issue with the content being devalued on mobile. So if you have content hidden for usability reasons, you shouldn’t have any problem with that content ranking properly. That said, hidden text – text that is NOT accessible to users – would still be against Google’s webmaster guidelines. So if you are hiding text for usability reasons, make sure you have implemented it correctly so it is visible to searchers when they land on your mobile page with tabs/accordions. Will this apply if the desktop site has tabs as well? Currently content is devalued behind tabs on desktop. Your article is definitely on point, thanks for the insight. I’m now designing and developing for mobile and use both accordions and tabs. The websites have experienced no adverse effects on both mobile and desktop. I suggest that the sites losing rankings may be due to overuse of collapsible features. Most HTML5 templates and WordPress themes come with a good mix of methods for displaying content for improved user experience. I recommend using that approach. Beware of thinking the collapsible content is some kind of panacea for stuffing content. Question: Is the “devaluation” of collapsible content on desktop a conscious effort or are Google’s desktop bots simply not up to date? I think for desktop, it is more to do with searchers landing on a page and expecting to find the content, but not finding it because it was hiding behind a tab somewhere – and on desktop, it is often not that obvious where it is hiding. But on mobile, it is more of a usability issue and people are quite used to expanding sections within a longer page on mobile, such as how Wikipedia handles it. So just to clearify, Google will still not grand hidden content as much value at desktop if it´s hidden, but on the mobile version it is the opposite? Using tabs and collapsible sections on mobile is good for user experience… less screen real estate to work with.